Not Another Sad Story, Yay! In my last article I was angry. In that state sometimes I get a little preachy, sorry. As I watched our beautiful Pink mare struggle in her last nightmare about the terrible abuse inflicted on her so many years before, I could only watch her and try to comfort her. I could not take away the horror that she had been carrying all that time. It was obvious she could not understand why so much pain had been inflicted upon her. What was the purpose? What was it that “The Torturer” wanted from her? It was obvious that her “training” was never completed, but what did happen completely shattered her mind and body. She could never forget, asleep or awake, she was haunted by the memories. Yes, I was angry. I hate being helpless, but I could not help her. Only death could take away her fears. Then along came Zephyr, my beautiful, incredible foal!! So kind, so good, with that “all the lights are on” look in his eyes, so focused on me, completely untrained. I knew the moment I saw him at 3 months old, just a little non-descript furball with sticks for legs, that there was something special about him. 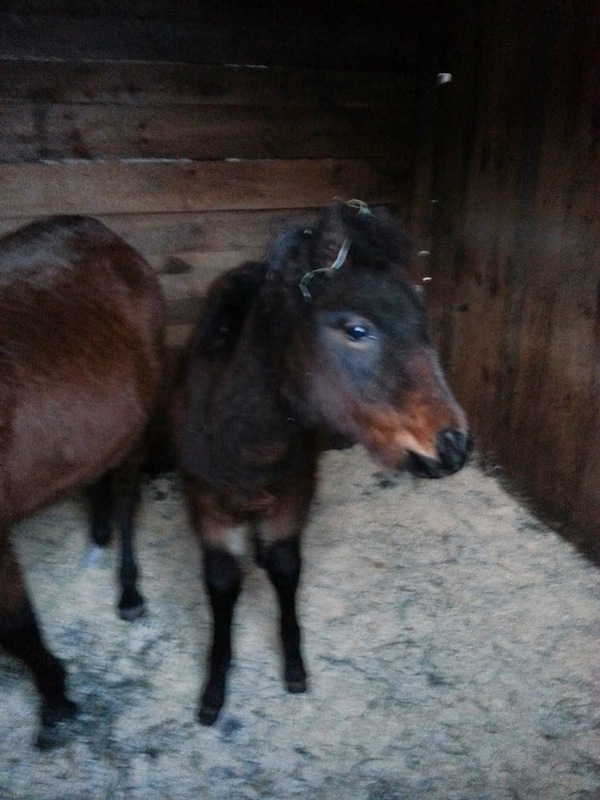 We got him and his mother, Thursday, in December and put them in a stall and did not have a chance to handle them much until Spring. By then Zephyr was bigger and untouchable. We managed to separate him from Mom in and ajoining stall and wrestle a halter onto his face, but he would throw himself over backwards if any pressure was applied. He also was still a stallion which comes with it's own group of problems. I am 63 years old. I have been with horses every single day since I was 12 years old. I knew how to ride a horse before I ever actually rode one. Horses and I have always “known” each other. I have seen the progression of “training” methods in this country grow and change. From the tie them down, to bucking them to a stand still, to terrorizing them into a “safe place”, and all of the other stuff in between. I watched as the “natural horsemanship” craze kicked in, some of it was just a more updated version of cruelty practiced through the ages. Through it all many horses actually learned stuff, from “trained helplessness” to spinning in tiny circles on one hind leg until their bones and muscles gave out. Ever obedient slaves. All of it just a testament to their ability to learn, no matter how brutal. To me “clicker training” was just something else to add to the list of training fads that have come and gone in my life. Well through the years I have made a multitude of my own mistakes. Through ignorance and a seriously insane temper, I have instilled fear and probably caused a few nightmares myself. Not knowing any better is the worst excuse of all, at least for me. Though most humans would not agree, I am not like that anymore, for the most part. Most humans are not able to live inside my energy field but the horses seem to like it. So do I. The horses know they can count on me (almost) all the time. I always felt there had to be a better way, that communication was the answer. But how? Horses have always been more intelligent to me than everyone else thought. They have been kind and patient for a very long time, though you can see the frustration in their eyes while trying to “explain” to us stupid humans. If we take the time to look, there is always a reason for their actions. And so here I have this brilliant foal, a pure clean slate, a sponge to sop up all the good on the bad of the world. Here too, is another chance for me too, to do it right this time. I felt this way about Viking Too in the beginning, but his spirit is Loud!! His actions are violent and he and I never “clicked” (forgive the pun). He is a horse for a younger person to deal with. Jessica who is 24 years old is taking him to her new farm in Maine. They will have a blast together. I am too old to be yanked around by the likes of him! The quiet, gentle spirit of my Zephyr is more my speed at my age. I am so charmed by him. With his huge liquid eyes and the softest nose in the world. He came along just in time to help with the heartache of loosing 4 beloved old horses in the last year. Now Jessica is my teacher. It was really hard for us to swap roles. For the last 10 years I was the teacher. But she has discovered the thing that I believe I have been searching for all my life, a way to communicate with non-humans. I watched the kids play the clicker game with their chosen ponies at EOTS and thought it was cute. The ponies responded and were taught to target and do little tricks. I still wasn't particularly impressed. When I was their age, unburdened by glimpses of mortality and the ability to ride any horse at all. Horses that willingly did anything I asked of them, I needed more convincing. Enter Zephyr. I had no control over him what so ever. Though we had some kind of bond from the very beginning, he was still not halter trained but very excited to learn things with me. But where to begin? So Jessica said “Why don't you just teach him to stand still?” … “Huh?” was my intelligent response. So Jess taught us our first lessons in clicker training. I am now a believer. In less than one minute Zephyr was politely standing next to me with his head turned slightly away, a click and a treat and he would have done that all afternoon! This came in very handy when the huge oak tree over his barn needed to be trimmed and he stood beside me for an hour while chainsaws screamed and huge branches swung from ropes while a man was strapped to the tree high above us. He was afraid at first, but the clicker game was definitely more rewarding and as I calmly stood there he felt safe. At that time he also learned to hack up. All of this took place without a halter or lead rope. He has since learned to walk beside me at the proper distance. We continue to progress together. He has now been gelded and is ready to move into the main barn where there are lots of mares. I could no longer put it off. 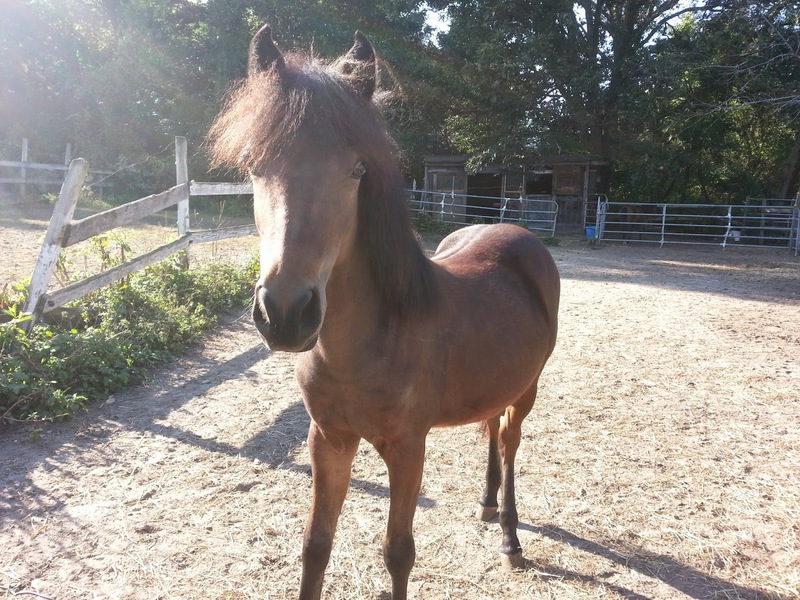 At 1½ years old, he had to be halter trained. With no real trouble at all, using the lead rope as a “target” if he began to get confused, I get his focus back by asking him to touch the rope with his nose. All that I know about clicker training is what Zephyr and I have learned together. Jessica is becoming and expert. And so just when I thought it was over for me, as I waited for the last of our old horses to die so I could quit, a new chapter begins. I guess you really can teach an old nag new tricks! When I remember out poor beautiful Pink and all the horrors she survived during “traditional training”, I am so sad. This needs to be a new chapter for us all. Horses don't have to be terrorized or forced. We owe them the chance to show us what they can really do by this form of communication.